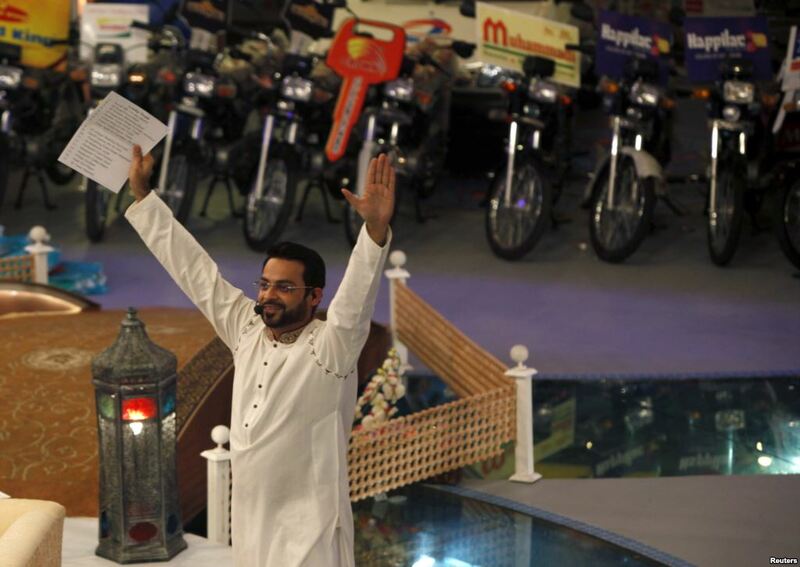 Aamer Liaquat Husain's Amaan Ramzan is the highest rated TV show in Pakistan. It attracts sponsor-ships and advertisements from successful companies in Pakistan which are willing to pay top dollars for a slice of its viewers' attention and business. These advertisers see the festive Ramadan and Eid season as crucial to boost their annual profits and sales. Downplaying the commercial success of his show, Aamer Liaquat insists that "it is not commercialization, it is not showbiz. It is real Islam. I am the religious icon of television" according to an AFP report. Aamer Liaquat's show is no ordinary TV production. The show is set in a massive wedding hall at a Karachi hotel. It is bedecked with advertisements for a variety of products competing for space with pictures of camels and palm trees. Its a variety show featuring Islamic quizzes, Quran recitations, cooking, religious songs, and lots of prizes and Iftar dinner for over 500 guests, including hundreds of women and children. Prizes given away at Geo's Amaan Ramzan show include consumer electronics, motorbikes, microwave ovens, washing machines and refrigerators. But eyebrows were raised around the world last month when Aamer Liaquat gave away an abandoned baby to a grateful childless couple on live TV. It was arranged by an NGO which insists that it followed the law. Critics called it a "publicity stunt" to boost show ratings. ARY TV, a competitor of Geo TV, has responded to Ramzan Aman show by its own show which features Junaid Jamshed, a celebrity rock star who gave up his singing career and grew a long beard as a sign of religious piety. Pakistan's rising middle class has helped spawn a mass media revolution in the country. It is driving consumer spending and advertising. Television ads capture 56% of total advertising revenue in Pakistan. TV ad revenue for 2011-12 added up to Rs. 21.6 billion (US $210 million), up 16% from the prior year, according to Dawn's advertising Aurora magazine. Since 1990, Pakistan's middle class has expanded by 36.5% and India's by only 12.8%, according to an ADB report titled "Asia's Emerging Middle Class: Past, Present And Future". Consumer spending in Pakistan has increased at a 26 percent average pace the past three years, compared with 7.7 percent for Asia, according to Bloomberg. Many in Pakistan cringe at the thought of crass commercialization of occasions like Eid and Ramadan both of which have special religious significance for Muslims. To me it is just an indication that the corporate-owned media business in Pakistan is evolving along the same commercial lines as its western counterparts have decades ago. It is, of course, a matter of grave concern to me and others who see the combined power of money and media as an unwelcome influence in shaping public opinion and government policies. Is Ramadan a Break from Work? This guy is anything, but religious. Shoeib: "This guy is anything, but religious." I agree. He's a successful showman and pitchman. This man has made good living out of religion! Sabih: "This man has made good living out of religion!" Aamer Liaquat Husain not the first to make money from religion. There's a long history of people using religion to amass wealth, power and popularity. Just look at the amount of wealth some churches have accumulated over the years. Then there are many rich televangelists with electronic churches in America who get tens of millions of dollars in donations. Multiple fatwas have come out against Aamer Liaquat Husain's Amaan Ramzan show declaring it "haram" for various reasons ranging from it being "makhloot" (Co-ed) to doing "taqaddus pamal" (sacrilegious). The problem is much bigger. And here is a deeper look at it. This is the most common misconception and this is exactly what I have handled in my article. The whole point is that every technology has its own inclinations that make it suitable for some purposes and useless or even harmful for others. Television is a very superficial medium which is wonderful for entertainment but detrimental to serious discourse. How? Details are in my article. Of course if you are not willing to take the time to listen to the counter argument then you can keep on repeating your own. In 19th century England there arose a group of people who were opposed to technology of that time. They had their reasons. But their name became a symbol for people opposing Technology. Such people are called Luddites. I did read Br Khalid Baig's article. ( just like I always read a lot on his blagh) Found it lacked balance. He showed all the negatives of using this medium. Where are the positives? As usual, he was in favor of restricted access. He would like a few elite people to communicate among themselves. His greatest fear is that by including the masses there will be pollution of thought and intent. Yes - that is very apparent. The results of misuse of the visual media is quite apparent. Nobody can deny. This is where we need to balance the usage of a medium for good purposes. I have no doubt that good will triumph over evil. But there has to be a fight - a struggle. You can not give up the usage of this medium just because at this time, we can not see the light at the end of the tunnel. In the US, there is a big debate about guns. Some say "guns kill people". Others say "people kill people". Rashid: "Such people are called Luddites"
The equivalent of 19th century English Luddite in Pakistan is "reactionary", an element within the ranks of Muslims who dismiss all new things as "innovation" or "bida"....things that are celebrated and embraced by the rest of the modern world. These reactionaries remind me of early fatwas against the use of loudspeakers and trains. I still remember the split our late NED Prof Salahuddin had with late Dr. Israr Ahmad when the good doctor prescribed dumping TV sets before he embraced the medium with alacrity. Well it also depend where and how it is used. I can give the example starting from self that I live in Makkah( no need to emphasize the sanctity of the place to Muslim) but I watch TV using my own discretion. My Family when in Karachi watches TV probably with no discretion!!! I have two cousin sister one in Karachi and one is Jeddah, both houses does not have TV ,even does not get news papers!! all 8 Children are Hafiz Quran . Now, I have two married daughter, one in Toronto and other in Detroit MI, both wear Hijab and both does not have TV in their home as they argue that it is not possible to have discretion when it comes to Children. Both are having very bright Children. The kids can use IPAD better then me at least . They all watches what they wish on DVD or down Load educational materials from NET, Quran, other religious materials, Children do watches cartoon. So use of Technology is present in it most modern form but regulated and use of discretion. I gave all these examples only to emphasize my point of view that nothing wrong in use but purpose must be what you want . Mujtaba: "...both does not have TV in their home as they argue that it is not possible to have discretion when it comes to Children. Both are having very bright Children. The kids can use IPAD better then me at least"
It's interesting that you see an iPAD with an Internet connection as wholesome but not commercial TV channels. Do you know that the young people today consume their entertainment mostly through the medium of Internet-connected computers rather than TV sets. Neflix Internet channel has blurred the distinction further with Emmy award-winning shows. Emmy awards for television shows are like Oscars for movies. The difference is that TV was & is still used mainly for entertainment, while computers & internet are mainly used for propagation of knowledge. Tremendous rise in commercialization has more adversely affected TV than the internet. This is very clear in Pakistan, where the difference between the few hours broadcast of PTV in the past and the 24 hour broadcasts of more than 100 private channels today is very prominent. Also, control over the content to be viewed is better on internet than on television. Hasan: "The difference is that TV was & is still used mainly for entertainment, while computers & internet are mainly used for propagation of knowledge"
The distinction between Internet and TV has already blurred in US as far as news and entertainment are concerned. I watch streamed movies on Netflix.com and cricket streamed on willow.tv through an Internet connection on my flat screen Samsung LED screen. It'll blur in Pakistan in the next few years. It is interesting that Mujtaba's daughters in north America are maintaining television free homes. They are not alone. Over here there is a movement that advises against the harms of television as a technology. Millions of people participate in the annual screen free week, which had started as TV-free week and evolved into screen free week as other gadgets replaced TV. I am not aware of any movement like the screen free campaign in the Muslim world. This leads to my observation that bad Western products become worse as they are transplanted into the East. This is because the checks and safeguards (even if weak) that have been developed here are stripped as they are imported there. And our view of technology as both inevitable and good ( a mark of progress) renders any resistance or critical examination impossible. This also applies to our Engineering education. There are two important components of Engineering education here that are missing from the one in the Muslim world. First, there is the concern for a broad based education. They do not want to produce one dimensional people who have a tunnel vision. They include a wide variety of subjects to broaden the horizons of the students. No doubt there are problems with their scope and content of this broad base. But the problem with our narrow base are glaring. Second, they have a course in Technology and Society offered to interested students. This deals with the impact of technology on the wider society. We produce engineers who have no concern for and no understanding of the impact of the technologies they will develop on the society. Our best electronic engineers can help build the network of mobile phone services without any concern for the disruptions in the society and social relations this is causing. Our best mechanical engineers can build efficient automobile assembly lines without any consideration of the nightmares of traffic jams or pollution or environmental impact of this mode of transportation. Our best engineers can build wonderful automation systems without any concern for the miseries caused by these. Sorry for the harsh assesment, but this is the unfortunate reality. To produce a well rounded engineer, we need a healthy load of non-engineering courses in society and culture, Islamic civilization, history of technology, history of colonialism, and social, economic, religious and cultural impacts of technology in their education. Once we start thinking in these terms we'll realize the importance of strong Islamic education for all professionals. Then we'll also realize the basic fallacies of the discussion on television. Technology is neither inevitable, nor inevitably a mark of progress. It is a human endeavor and like all other human endeavors is a result of complex and conflicting societal forces. It gives and it takes away. And sometimes it takes away more than it gives. And it is important that we produce engineers who understand these conflicts and maneuver them in the real interest of the society. This also means that we need to critically examine every new technology before giving it our ok. Just like they have environmental impact reports on big projects, we need social, cultural, economic and spiritual impact reports about new technology. Are we producing engineers who could author those reports? If we realized this, we would consider it a golden moment when our ulama said when loudspeaker was being introduced in the masjid: "Wait a minute. We need to examine it before we give it our ok."
Khalid: "It is interesting that Mujtaba's daughters in north America are maintaining television free homes. They are not alone. Over here there is a movement that advises against the harms of television as a technology...."
Talking about technology and society and shunning of tv in America, there is an Amish community which still shuns televisions and telephones and travels in horse-drawn carriages. Amish men have long beards and women cover their heads. The biggest insult one Amish can inflict on another is cutting off men's beards and women's hair. There have been several instances of it resulting in clashes. Going back in history, it was the industrial revolution that created technology that led to the ascendance of the West and the colonization of the East. It marked the beginning of a major shift in economic, military and political power from East to West. Resisting technology will maintain the status quo with the West lording over the Muslim world. BTW, they also shun electricity and photography and quit school after 8th grade education. ^^RH: "Resisting technology will maintain the status quo with the West lording over the Muslim world"
It's not just the West. If the current rate of violence, chaos, economic instability continues for 10-20 years more, even the Buddhist/Hindu world will be lording it over the Muslim world. Syria is in civil war. Bahrain faces a Shia uprising. UAE faces a banking crisis. Turkey is sitting on a debt bomb. In 20 years, the Muslim World may wind up as the most BACKWARD region, with even Congo surpassing us. We are very close to TOTAL failure. HWJ: "We are very close to TOTAL failure." If it means Muslims, then all the available credible data shows that "we" are not shunning technology. In fact, Muslim nations are way ahead in the use of technology than the vast majority of "BRIC" population. Even the Al Qaeda terrorists are prolific users of technology. IT was some time in the first half of 2009 that I got a call from my director news telling me that the newsroom was now looking for more stories from the city of Faisalabad because the people meter, the ratings tool, had just been installed in that city. For the first time, ratings were going to be reported from Faisalabad, and all the channels were rushing to up their coverage of stories from the city so as to capture the ratings that were going to be reported from there. So suddenly the bureau chiefs in Faisalabad started to come under pressure to increase their story counts. Anyone who has ever worked in television news knows how reporters and bureau chiefs complain about how their area gets neglected by the folks in the newsroom, how they bring in all these wonderful stories but the folks in the newsroom don’t run them. This time, however, suddenly the tables were turned. Faisalabad had been a bit of a backwater in the news business until then, with small bureaus and small staffs and a trickle of news coming out occasionally that held any interest outside the city. But suddenly, there was an inordinate amount of interest in news from the city, and bureaus found themselves inundated with demands for packages and news and what we used to call ‘chunks’ in the parlance of our rundown producers at the time. And this is what happened. All the reporters worked their contacts for news and sound bites and other tidbits. Almost all of them started reporting the same story: Faisalabad was experiencing large spells of load-shedding, and power loom owners were protesting outside the offices of the Faisalabad Electric Supply Company (Fesco). There’s no news like live news, and almost instantly the orders came from the newsroom to send a DSNG van to the site of the protests and prepare for a live uplink. For the first time, Faisalabad saw itself live on air on the major channels, and very quickly the size of the protests swelled. As the numbers grew, so did the amplitude, and very quickly tyres were brought out to be burned. Burning tyres make for great footage, there’s fire and smoke and commotion all around them, and if you position the camera right, you can catch pictures of huge columns of smoke rising above an agitating mob. The newsrooms loved it, and the more they stayed live on scene, the more agitated the scene became. The whole thing ended with the mob storming the Fesco offices. The anchors screamed about a crisis brewing in the city, as the screen showed looped footage of a mob smashing windows and chasing Fesco staff. That night the talk shows were abuzz as opposition politicians railed at the government for allowing matters to come to this. Faisalabad was propelled into the national news flow very suddenly, and the immediate arrival of the television spotlight had a very damaging impact on that city initially. The power riot found no such national leadership, only sporadic and very opportunistic local leaders who were easily co-opted or sidelined, and therefore has largely vanished from the scene. In the final days of the interim government, load-shedding had hit a peak never before seen in the country, but the streets by and large remained calm. The media’s mirror is a dangerous tool. It reflects the reality it sees, but reflects it selectively. The television spotlight can illuminate, but it can also incinerate the reality upon which it is trained. In the first batch of ratings for the month of Ramadan from Pakistan, ARY Digital has been crowned the clear leader. According to Medialogic data for Females CnS (calculated 15 minute time-bands), ARY Digital grabbed 1285 GRPs in the first ten days of Ramadan. Express Entertainment boasted of 1230 GRPs, while Hum TV was a distant third with 559 GRPs. In further good news for ARY Digital, its gameshow ‘Jeeto Pakistan’ raked in 8.62 TRPs between 19:30 and 22:00 on Wednesday 9th July. During the same period, Express Entertainment was second with 5.18 TRPs, A Plus in third with 2.13 TRPs and Urdu 1 in fourth with 1.43 TRPs. In the UK, ‘Jeeto Pakistan’ is aired at 20:30 on ARY Digital. Pakistan’s total advertisement budget has exceeded Rs65 billion in the last few years with a growth of 10 to 12 percent annually. As much as Rs45 billion goes to TV, while Rs17 billion are spent on print media, said Fouad Hussain, Chief Executive Officer (CEO) of GroupM, the biggest ad buying house of the country. “The total billings of the television and print media ads through GroupM are around Rs19 billion, which is over a quarter of the total advertisement budget of the country,” Hussain told Pakistan Today in an exclusive interview. Hussain has a 17-year experience in the media industry and has been working with brands and media vendors in various roles of brand marketing, research, channel sales, content, strategic communication, media planning and ad buying. He said most of the TV channels in Pakistan are relying on mobile companies and new brands of mobiles, which are spending billions of rupees on Television ads. Brands like Unilever, Engro Foods and local and foreign banks are slowly shifting to TV from print media, he said. Hussain, however, said the cash flow management in TV channels and print media is a problem. “I will not name any channel or media house, but many of the owners have other businesses and use media industry funds on their other businesses which causes delay or late payments of salaries to their employees,” Hussain told Pakistan Today. He said that there could be some other problems like late clearance of the bills, but the other businesses of the owners of media houses are the main reason for cash flow problems. The GroupM CEO said the size of the print media ad budget has also been increasing during the last five to 10 years. He said the brands have been increasing their print media budget overtime. He said the newspapers have also increased the cost of advertisement per centimeter. “If a newspaper was charging Rs10,000 for an ad five years ago, it is now charging Rs100,000,” Hussain said, and added, “It is true that the TV industry has more of a bright future in the country compared to print media.” He said that the print media has been losing its share of the market because “unlike the TV industry, there is no new research work being done in the print media”. Now, everyone knows which TV channel is more popular and in which city; and the advertisers also know where they need to focus. But it is hard to find out the same information for newspapers. No one knows which newspapers are being read and in which city or area. “I will not say that the readerships of the newspapers are coming down, but it is hard to find out the exact figure.” He said the All Pakistan Newspapers Society (APNS) should conduct a survey of the newspapers’ readerships locally and area wise once every two or three years. “We are a kind of advisors between advertisers and the media. We have to suggest to them where their market is,” Hussain said. Replying to another question, he said the Audit Bureau of Circulation (ABC)’s figures are only for the government advertisements. It is a demand of the federal and provincial governments as they are supporting the TV channels and the print media through advertisements. The government spends Rs6-7 billion on advertisements in the media,” he said. The ABC certification does not mean readership and it does not tell which area the newspaper is being read in, he said, and added that it is very difficult to find that out. He said that the APNS should conduct a survey through a reputable institution like the TV industry. Munizae Jahangir: " The Geo-ARY debacle was perceived to be a proxy war between the establishment and the government of Pakistan." The case failed to draw that much attention but, as 2016 drew to a close, a court in London convicted the owners of ARY News of slander and libel and awarded $3.7m in damages to the plaintiff, Geo TV. What set this case apart was the fact that a British court was ruling on a squabble between two of the biggest media players in Pakistan. The very public battle between Geo TV and ARY has been characterised as a low point for the Pakistani news media. The TV news sector in Pakistan has exploded in size in the 15 years since the days of only one, state-owned domestic channel. But the quality of the journalism often gives way to sensationalism and irresponsible reporting, and, in this case, reckless accusations of blasphemy. Some see the conflict between Geo and ARY as a kind proxy war for a larger struggle, involving the Pakistani powers that be - over who really controls the country. The Listening Post's Meenakshi Ravi reports on a slightly complicated media story that reveals much about politics and power in Pakistan. "The competition was rooted in how well the channels themselves were performing ... but over time, it morphed into something way more ugly, way more public," says Sadaf Khan, director of programmes, Media Matters for Democracy. April 2014 marked a turning point in the competition between the two channels. An attempt on the life of Geo News' most prominent anchor, Hamid Mir, put the journalist and his channel on a collision course with the Pakistani intelligence agency, the ISI. Mir had reported extensively on the agency and said he was convinced it was behind the attack. This wasn't the first time the ISI was accused of targeting a journalist. In 2011, investigative reporter Saleem Shahzad was kidnapped and then found dead in northeast Pakistan. Shahzad had documented three warnings from the ISI, letting him know his work had put him on their radar. Now, three years later, the Mir case put the lingering issue of alleged rogue operations of the ISI back in the headlines, and ARY waded into the debate. When ARY backed the ISI, it ostensibly aligned itself with the intelligence community and the military - the Pakistani establishment. Geo, on the other hand, was seen to be allied with the elected government. "The Geo-ARY debacle was perceived to be a proxy war between the establishment and the government of Pakistan," explains Munizae Jahangir, senior anchor and executive producer, AAJ Television. ARY News made it personal by accusing Geo TV owner Mir Shakil-ur-Rahman of taking money from Indian intelligence and using it to defame and discredit Pakistan. Such accusations can get you killed in Pakistan. "One of the main allegations was that we had run this campaign for peace between India and Pakistan, which was a media-led campaign - The Times of India, and The Jang Group had come together. This was completely an initiative that was funded entirely by ourselves - we had absolutely no funding from any international organisation, let alone intelligence agencies, and, and yet, continuously, documents were waved on the screen," says Geo TV president Imran Aslam. "The editorial stance taken by our channels on various issues are different ... However, if you work on the behest of any government or you ally yourself with a government, then your journalism is flawed and the Jang and Geo group's output are perfect examples of this," says ARY News host Arshad Sharif.